Carol A. Manzer, 70; passed away Tuesday at Oswego Hospital, Oswego. She was born in Fulton, NY to the late Carl and Catherine (Fitzgerald) Manzer. She has been a lifetime resident of Fulton. Miss Manzer has been past employed with Walgreens as a Cashier, and a Nurse’s Aid with Michaud Nursing Home, Fulton, A.L. Lee Memorial Hospital, Fulton and Oswego Hospital, Oswego prior to retirement. She loves animals, NASCAR and she is avid fan of high school, college and pro sports. Miss Manzer was pre-deceased by her sister Cathy Manzer. She is survived by her brother Robert (Shelley) Manzer of CA, and Mary (Paul) Tetro of Fulton, and several nieces and nephews. 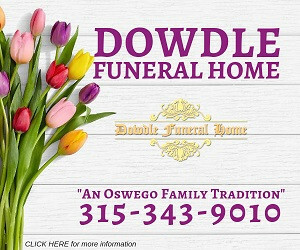 A Funeral Service will be conducted 10:00 AM Tuesday, April 9th at the Sugar Funeral Home, Inc., 224 W. 2nd St. S., Fulton with Pastor Steve Nehlsen officiating. Burial will be held in St. Mary’s Cemetery, Fulton. There will be no calling hours.